It is a sad fact, but a fact nonetheless, that there are very rare occasions on which you can just get unlucky and be involved in an accident, whether minor or major, that you are powerful to do anything about. However, the vast majority of the time by being alert and aware of road conditions, you can keep yourself safe by reacting appropriately to hazards that could develop into potentially dangerous situations. 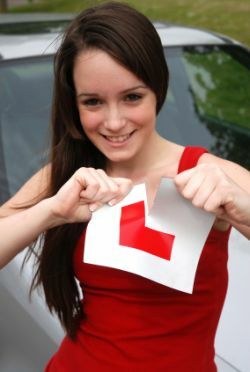 You should apply all the techniques you learnt whilst you were a learner, such as when and where to observe in the mirrors when you are about to drive off, whilst performing reversing methods, remembering how to do an emergency stop, remembering to look in the blind spot as appropriate and reacting to road signs when they instruct you to do something. There are certain practices that will help to keep you safe. Firstly, remember to look sufficiently ahead. You may do this naturally but some people look too close at the road infront of them. One method to help you with this is too imagine that the car headlights on full beam go much further ahead and let you see much more than when they are dipped; similarly your eyes should be on 'full beam'. Remember to use the mirrors as necessary. You will have been taught whilst learning to drive when and how to use the mirrors, and the times it is particularly important to use them. Remember that moving your eyes around whilst driving is important because when you are looking straight ahead you might miss important information from other directions that can be revealed for instance in the mirrors: a potential hazard could be behind you like a car zooming up behind you rather than ahead of you in the road. You should also actively be alert and looking out for potential hazards; being forewarned is forearmed as they say meaning that if you know of something in advance then you are better equipped to deal with it. If you see a vehicle coming up particularly quickly from a road that feeds into your road, then you can be alert that it might pull out right in front of you or potentially you might get there at a similar time, so you are primed to react accordingly should anything untoward happen. Next, be sure to remember your stopping distances and therefore that you leave sufficient space in front of you to react. Whilst many drivers don't seem too aware of this and drive far too close to other vehicles, that is no reason to do the same. Finally, ensure that you signal correctly. There are many occasions whereby you would think the rules of the road are random: look at a roundabout and you'll see vehicles performing the same manouevre performing a wide range of different signals with some indicating, some not, some indicating just as they're about to leave the exit whilst others do even stranger things. But the rules are simple: stick to the correct rules for signalling for safer driving.